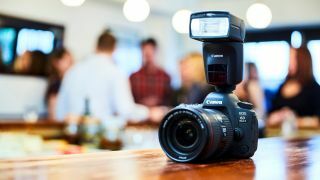 Rounding off a raft of announcements from Canon is the new Speedlite 470EX-AI. The elevator pitch is as follows: it’s an intelligent flash, able to automatically pivot to create the optimal angle for bounce flash. The tech is called AI Bounce, and it works by using a burst of pre-flashes to measure the distance between the camera and the ceiling, and between the camera and the subject. Once this is established, the Speedlite automatically adjusts the angle of its motorised flash head for the right bounce angle. Furthermore, it's also capable of automatically compensating to keep the bounce angle the same if the camera is shifted between portrait and landscape mode – the user simply needs to half-press the shutter. The 470EX-AI carries a guide number of 47m at ISO 100 and covers a lens range of 24mm to 105mm, although the former figure is expandable to 14mm with a built-in adapter. The unit also has high-speed-sync functionality, together with a wireless optical receiver that means it can be used off-camera at distances of up to 10m. When powered by four AA batteries it’s capable of recharging silently in 5.5 seconds, and this goes down to 3.5 seconds when powered by rechargeable NiMH batteries. The Canon Speedlite 470EX-AI will be available to purchase from April 2018, priced at £499.99 in the UK and $400 in the US. Australian pricing is still to be confirmed. In the meantime, visit Canon’s official website for more information.